The legend continues! Stand by for two more adventures with the world’s greatest and most famous secret agent, James Bond, as some of his most thrilling missions are collected for the first time ever in a deluxe collectors’ library edition! 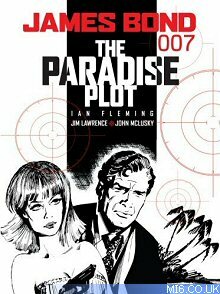 In this latest action-packed volume, Bond teams up with fellow 00 agent Suzi Kew once again on another sun-soaked escapade, The Paradise Plot. Not seen since its original publication in British newspaper the Daily Star back in 1981, the adventure Bond travel to the Caribbean to track down Father Star, the head of a sinister cult which has an impressive collection of high-tech aircraft to make stealth attacks on high-value targets. This new, never-before-collected edition also includes Deathmask, first syndicated in the Daily Star in the UK in 1982. The story has 007 hunting for the source of a new deadly virus and his only clue is the titular deathmask left in the hands of a dead spy. Plus a new introduction by David Hedison (Live And Let Die & Licence To Kill) and an exclusive feature on rare James Bond comics from around the world! Syndicated newspaper comic strip checklist.